If you want to succeed as a real estate investor, you need to know how to find motivated sellers. That's not just my opinion, that's a fact. When I first started pursuing my real estate investing career, I wasted a TON of time trying to find these people the wrong way (at one point, I was almost convinced it was impossible). There finally came a point when I was just about ready to throw in the towel – and that's when I discovered the power of direct mail marketing. But it wasn't just ANY direct mail marketing that did the trick. There were some very specific steps that simply had to be followed – and if I didn't put the time and effort into doing it right, I'd end up throwing a lot of money right out the window. Moving through the process wasn't always fast, convenient or cheap – but when I took my time and carefully went through the right motions, the floodgates opened WIDE and I was inundated with more opportunities than I could handle. Direct mail was a pivotal discovery in my journey. Knowing how to obtain the right information and use it correctly had EVERYTHING to do with my ability to find unbelievable deals (truth be told – I can't think of any notable success I had prior to this discovery… it was that big of a deal)! The funny thing is, for most of the world's marketers – direct mail is actually an incredibly ineffective marketing medium (it's the only industry where a 1% response rate is considered “acceptable”). As real estate professionals, we need to have a higher standard (because let's be honest, most of us can't afford to dump millions into a strategy that isn't consistently working). Luckily – the answer is simple… the real power behind a successful direct mail campaign is in the data. When you're working with the right information (i.e. – data that is current, accurate and reliable) and when you understand how to filter it correctly (so the right people are ON your list, and the wrong people are OFF of it), you should expect to have a response rate somewhere in the range of 5% – 20% (and if you're lucky, maybe even higher). To some, this may seem impossible pull off, but with a basic understanding of where to go for the information and how to filter it properly for the specific types of properties you're looking for – it's not nearly as complicated as it seems. If you've ever sifted through a list of property owner information directly from the county – you probably know what I'm talking about. In some cases, this information is presented in a crazy, unpredictable and potentially dangerous format, and one misstep can be costly. The good news is, there are several data companies out there who have managed to bring some semblance of order to this jungle. They've combed through most of the 3,143 counties in the United States (and the wildly different organizational systems they all use), and made it substantially easier to find the information we're looking for. Bringing order to this quantity of information is a huge undertaking. We're talking about THOUSANDS of extremely complicated assessor files that are changing every single day. Getting this kind of information under control is not a simple task, and if you're a direct mail marketer and/or real estate professional who uses this information for the purpose of direct mail, this kind of organization could definitely be worth paying for. In this blog post, we'll take an inside look at a few of the major players in real estate data, and we'll examine what each one brings to the table, what their services cost, some of the pros and cons with each one, and what you can expect to see if you decide to work with them. We're also going to talk about some important aspects of real estate data that can have a big effect on the success of your direct mail marketing efforts. Of all the data services I've explored to date, DataTree has the most well-designed and easy-to-use interface. Depending on which features you use and how much data you need to pull, it may also be the least expensive option on the market. You can also see more of what this program can do in terms of property research in this blog post and this blog post. Note: We do have an affiliate relationship with DataTree. If you sign up for the service through our affiliate link, you'll get a discount off the regular price of the service, and REtipster.com will get a very small commission if/when you choose to sign up. Relatively inexpensive with an entry-level subscription. Very easy to pull lists and do property research. The advanced search function offers several filtering options, with the ability to mix-and-match certain filtering criteria in a way that I haven't seen from any other data service – which allows lists to be VERY targeted and specific. Most (but not all) counties come fully stocked with GIS mapping data, making it very easy to find property parcel lines and boundaries (this is especially useful for vacant land investors). One subscription offers access to the entire United States (not just a single county). Users can see the individual records before downloading the list. In my experience with DataTree, their customer service was excellent. Some counties are less current than others. However, it's always easy to verify when the data was last updated by simply pulling up any individual Property Detail Report in the county where you're working. The standard pricing for DataTree will vary depending on what you're planning to use it for, and which plan you select. Property Characteristics Report – this is what you'll use for each lead you pull when downloading a list. Property Detail Report – this is what you'll use when researching a property individually. TotalView Report – this is like a SUPER detailed version of the Property Detail Report. It will show you literally everything they have on file for the property you're researching. DataTree uses a “credit system” of sorts, where you agree (on a 12-month contract) to pay a set amount each month for the ability to you use the service. When you pull a Property Detail Report or a Property Characteristics Report (or anything else listed above), each instance will deduct the quoted amount from the monthly credits have you available. Once you exceed the number of credits you have at your disposal each month, it will continue to charge you above and beyond your monthly commitment, for each time you use it, at the same quoted amount. So, if you know you'll be pulling a TON of data, it obviously makes sense to sign up for the Gold subscription, because the cost of each additional pull will be exponentially less than if you signed up for the Bronze subscription. What I like about AgentPro247 is that it's fairly easy to use, easy to sign up AND it offers one of the better property research tools I know about. It's not JUST about the lists you can pull (though that's certainly an important aspect of it), it's also about how easy they make the due diligence process, especially for “niche” property types like vacant land. What I found in my research was that ALL data resellers have this issue on some level (it's one of the unfortunate tradeoffs/risks when you're not getting your data directly from the county). The difference with AgentPro247 is that they'll actually tell you about it – which I certainly appreciate. The farm list function offers several filtering options, allowing lists to be very targeted and specific. Delinquent tax data is available in some counties. Some counties are less current than others. However, their Geographic Coverage tool shows when data was last pulled in each county. Depending on the subscription plan, there are limits on data usage (though this won't affect most of the lower volume users). Customer Services exists, but they aren't the most responsive. 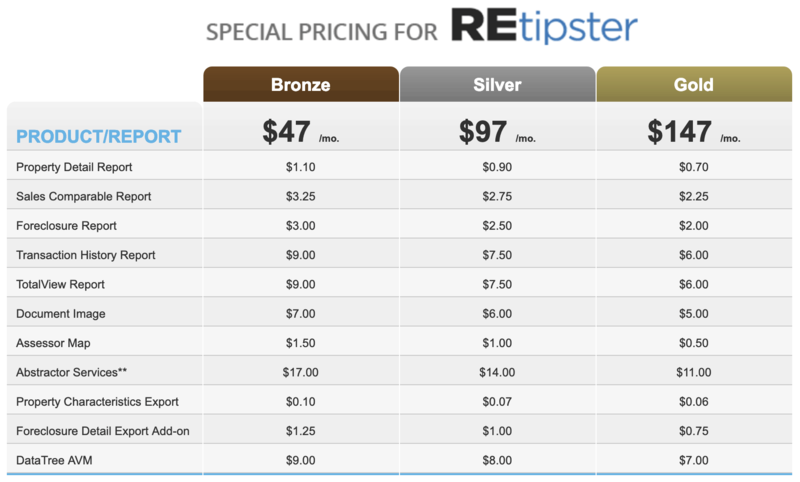 The standard pricing for AgentPro247 will vary depending on what you're planning to use it for. AgentPro247 actually increased their prices pretty significantly in mid-2017, which is a bummer… but even with the higher prices, it's still a pretty decent service and the cost is still less than most of the other options mentioned in this blog post. DISCOUNT: If you want to use the exact plan I do, follow these instructions and enter Partner ID: CFGRSH at checkout (I recommend either the Profile Package for $27/mo or the Gold Package for $72/mo). Important Note: The Gold Package is intended for users who want to regularly pull lists from AgentPro247, but keep in mind, you don't NEED to sign up for this plan just to download lists. If you sign up for the Profile Package, you can still purchase data dollars when you want to create a direct mail list a la carte (and these leads are $.05 each). If you don't need to download lists every month, you can save quite a bit of money this way. The Profile Package will give you a set amount of profile reports each month (for property research) and you'll still be able to send direct mail dollars for your lists whenever you want to pull them. ReboGateway takes a slightly different approach to how they offer data. Rather than giving you one giant pot of information (i.e. – the entire United States) with a limited number of leads to pull each month, they'll give you access to unlimited data from one county (with additional counties available at a slightly higher cost). If you're a real estate professional consistently working in one or two counties, this could be exactly the kind of solution you're looking for. ReboGateway also has a product called Investor's Title Toolbox, which does all the same things ReboGateway does, but gives subscribers nationwide access, as well as the ability to search all types of properties including commercial and be able to filter by loan to value. ReboGateway and Investor's Title Toolbox are a bit different in that they specialize in finding unique situations that create highly motivated sellers. Most data companies will simply provide a filter, where you have to decide what types of leads you want on your list. ReboGateway does this too, but they also offer some pre-selected criteria that aren't available in most data filters from other companies. These situations all have one thing in common – there is a higher likelihood that the property owners are in a position where they want out of their property NOW. To get an even more potent list of motivated sellers, you can also double-up on these items. For example – you can pull a list of properties where the owners have filed for divorce, the property is non-owner occupied AND it's back due on property taxes. With this kind of combination – you're virtually guaranteed to get a list of property owners who desperately need your help. The data is very rich, with a lot of useful filtering criteria and supplemental tools for direct mail campaigns. Lists are very well-organized and can be exported in a number of different file formats. Users will get unlimited data from the county/counties of their choice. Information is best suited for pulling lists, but can also be used for researching individual properties (similar to AgentPro247). Tax-Delinquent Data is Available in some areas (though not all). Users can see the individual leads before downloading the list. Excellent Customer Service. As a paying subscriber, you'll get unlimited one-on-one tutorials and webinars so you'll never be lost or confused about how their system works (their sales reps will even pull your first list for you). Data is only available on a per-county basis (you can't get access to everything in the United States with one subscription). If you're searching with the “tax default” option checked, you can't search the entire county at once – only by city and/or zip code. There is currently no filter option for “vacant land only” and there are only a few basic options available for property types. Their system doesn't include GIS data or show any property parcel lines (this is less of an issue for conventional investors who buy houses and buildings, and more of a setback for land investors). Not all of the filtering criteria are available in every market – you'll want to verify which options can actually be used in your geographic area of interest. I think ReboGateway is a great option for some, but not all investors. For the investor or real estate agent who has a business focused in one market or county, it will probably be a very helpful tool in a lot of ways. On the other hand, if you're an investor who is constantly pulling lists and researching properties all over the country, there may be better alternatives out there. ReboGateway also offers the following subscription plans (without the free additional county, waived set up fee, VIP List Development, or grandfathered pricing). Monthly: $44.95/mo, plus $14.95 for each additional county. 6 Month Plan: $224.95 (save $45), plus $89.70 for each additional county. 12 Month Plan: $399.95 (save $140), plus $179.40 for each additional county. Keep in mind, if you want the promo code discount mentioned above, you'll have to sign up for the annual subscription. RealQuest Professional is a service that can be used for researching properties and generating lists (a similar concept to AgentPro247, but at a much higher price, with information pulled from a completely different database). Similar to ListSource, RealQuest is a platform by CoreLogic (which means the data for both services is pulled from the same pool of information). The user interface offers a lot of flexibility and options to meet the needs of most real estate professionals. Here's an overview of how to generate lists with RealQuest. And here's an overview of their property research tool. Something I appreciate about RealQuest is its wide degree of functionality within their system. I also appreciated that (similar to AgentPro247), their service allows users to see the “Latest Recording Date” – so there will never be any question as to the currency and accuracy of the data you're working with (and when it comes to direct mail – this is a big deal). The only thing that turned me off from RealQuest was the price (which was very high in comparison to the other services on the market). I also wasn't a fan of how their subscriptions are only available with a 12-month commitment. These high barriers to entry made the service a tough sell for someone like myself. Access to data anywhere in the United States (with the higher level subscription packages). Users can reference “Latest Recording Date” to verify how current the database is in each county. A very flexible system in determining the recipients that go into the desired list. Versatile functionality and GIS parcel mapping data are available for doing property research and locating properties. Most of the CoreLogic database is kept very current and up to date. No Delinquent Tax data available. The service is only accessible through a fairly expensive, 12-month subscription (with additional charges for using their list generating service). Higher barriers to entry (signing up can only be done through a live call with a sales rep, and subscriptions are only available with a 12-month commitment). One of the most expensive subscriptions on the market. Note: The Starter Package is for one state only. Note: The Growth Package covers the entire United States. Note: The Portfolio Package covers the entire United States. From what I saw, this service has some very good information and their system works very well (I couldn't detect any glitches or problems in its functionality) and I was very impressed at how the filtering criteria allows users to narrow down the types of properties on each list to some very specific segments. The only downside I saw was that the service costs 10x more than every other option on the market. RealQuest is not cheap. But here's the thing… I'm not a heavy data user. I've never been one to send out 10,000 mailers per month, and my business doesn't rely solely on direct mail to find motivated sellers – so even though I could easily fit this into my budget, it would be overkill for my situation (like trying to kill a fly with a canon). On the flip side, if you are a high volume data user and if you need to get extremely specific about the types of recipients who belong on your lists, this could be precisely the service you need to bring your business to the next level. ListSource is another service by CoreLogic, and it's one of the more well-known platforms for generating direct mail lists. This service is extremely popular because of its convenience. It is very easy to generate a one-off list (similar to Melissa Data) with no subscription required. That being said, ListSource does not have any function available for property research (like RealQuest, AgentPro247, Melissa Data and ReboGateway do), so you'll only find it useful if you're in need of a direct mail list. That being said, if a quick list is what you're after (e.g. – if it's your first time pulling a list and you're not ready to commit to a subscription) – it's a nice option to have at your disposal. This video below (taken from a blog post I published last year) will give you an idea for how their system works. The only downside of ListSource is almost entirely in the price. A common theme I found with CoreLogic brands is that they aren't cheap. However, the service seems to make up for it in convenience and ease of use. The fact that you can use it without any long-term commitment makes it an ideal option for the beginner (and for the long-term user, there are discounts available if you're willing to utilize their bulk pre-pay and/or subscription options). Access to data anywhere in the United States. Extremely convenient, with no subscription required – very easy to generate lists in a matter of minutes. Very flexible filtering criteria in determining the recipients that go into the desired list. Decent customer service is available. No convenient way to know when the data was last updated for each county. No way to research individual properties. One of the more expensive list generating options on the market. *Rates based on standard property lead filters and output selections. Without a subscription or prepaid draw account, the average cost for a one-time list will be in the range of .30 – .45 cents per record. In my experience, the lists I've generated were around .18 cents per record – so the price doesn't necessarily have to be quite this high. The cost will vary depending on which filtering criteria you're using. Note: ListSource requires a $50 minimum purchase through their website and PayPal is the method of payment (however, this not apply to pre-paid purchases). When you purchase your farm lists or property reports from a data service like DataTree, AgentPro247 or RealQuest Pro, these services pulling the information from the database they're associated with and then delivering it to you in a usable format. As you can imagine, there are MANY different uses for this kind of information and as real estate professionals, the most common uses are conducting property research and doing direct mail campaigns. Just speaking for myself – I've used this information to make some major investment decisions, and I've done some sizable direct mail campaigns with the lists I've generated from them. It goes without saying, with the amount of money we're putting on the line, it is very important that we're able to rely on the currency and accuracy of this data. If the data isn't reliable, the results can be disastrous. Data companies understand this and make every effort (and generally do a good job) of keeping their databases as accurate and up-to-date as possible. The problem is… some counties (typically, the rural ones with a smaller tax base) aren't great at making this information readily available, and some counties just don't make it available, PERIOD. As such, you'll find that most of the data from these services are reasonably current (i.e. – within the past 30 days) but occasionally, you'll encounter some counties that aren't. Since the currency and accuracy of the data is simply a prerequisite to any successful direct mail campaign or research effort, I decided to do a side-by-side comparison of all three databases, to see if any one of them came out better (or worse) than the others. I took a random sampling of 50 counties around the country – 25 densely populated “Urban” counties and 25 sparsely populated “Rural” counties. 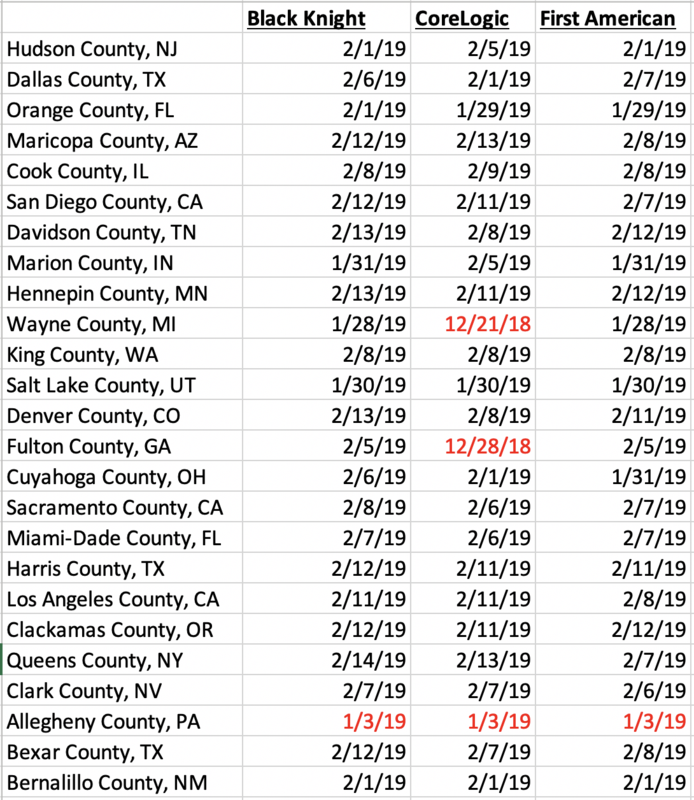 I conducted the test on February 18, 2019 – and got the following results (note: to draw your attention to which counties were older than 30 days, I've shaded those dates in red, and the counties that were older than one year or not available at all were shaded in bold red). As you'll see from this sampling – most of the densely populated areas were kept very current in all three databases (even the “older” ones weren't much more than 30 days behind). As I mentioned earlier, my assumption is that these counties are kept current because the governing bodies have a MUCH greater source of tax revenue, thereby allowing them the budget to keep their records current and published for these data compilers. As you'll see from this sampling – most of the sparsely populated counties were much less predictable. Roughly half of them were over 30 days old in all three databases, but many of them were still dated within the past year (with the exception of a few – which either had no data available or hadn't been updated in a long time). Since these counties have a MUCH smaller population than the previous list, I can only imagine that these governing bodies are working off a smaller budget and thereby have fewer resources with which to keep their records up to date. Who Has The Best Information? Remember, there are well over 3,000 counties in the United States, and 50 random counties is a VERY small sampling with which we can draw any sweeping conclusions. However, I think it does give us a reasonable idea of how all three databases are doing. Based on the information I saw, it didn't appear that any single database was notably better or worse than the others. CoreLogic seems to be stronger in some counties, just like Black Knight seems to be stronger in others, and First American offers the best in its own set of counties. All in all, they all seem to be in the same general place in terms of how current and reliable they are as a whole. None of them are perfect, and as much as I wish I could point you to one obvious choice, I can't say that one of them was the far-and-away the best over the others. If you want the best possible response rate from your direct mail marketing efforts, it's critical that you're sending your message to the right people – and the only way to do this is to use the right filtering criteria to generate your list. In order to do this with any success, you need to know EXACTLY who your target audience is – and take special care to specify what types of properties and owners you need to include (and exclude) from your list. Every service works a little bit differently, so it's impossible for me to tell you exactly which filtering criteria you need to use – but you'll find that most of them have many of the same general filtering options available. Tax Distressed/Default/Delinquent: YES (if possible, only include the properties that are currently delinquent on their property taxes) Note: This will substantially decrease the size of your list, but will also greatly increase its potency. Remember – your filtering criteria may vary depending on the type, size, location (and more) of the vacant lots you're trying to target. Tax Distressed/Default/Delinquent: YES (include only the properties that are currently delinquent on their property taxes) Note: This will substantially decrease the size of your list, but will also greatly increase its potency. Depending on which service you're using and which county you're pulling your list from, there will be times when not all of these filtering criteria are available. For example – the “Tax Default” option isn't available from all of the services listed above – and of the ones that do make it available, even they can't provide this information everywhere, because this data changes daily and many counties aren't sophisticated enough to publish this information on a daily basis. That's okay – but it also means your list may be a bit more “watered down” in terms of finding the specific types of property owners you want to talk to. If you're still determined to get the tax delinquent data from these counties (as I usually am), your only alternative option is to get a delinquent tax list directly from the county. Probably the most effective filtering technique I've ever found is to narrow down the property owners who are currently delinquent on their property taxes. When someone owes back due property taxes, it's usually a BIG red flag. For one reason or another, the owner and their property are a TOTAL mismatch, which inherently makes them highly motivated to sell. Some (but not all) of the services above will offer “Tax Default” or “Tax Delinquent” as one of their many a filtering options in some (but not all) counties. The challenge with this kind of data is that it's very time sensitive. It changes daily, which makes it even more challenging to track. If you find a county that is current and has good information, it can work extremely well, but once the data is more than a few weeks old, there can be some substantial changes to that list – which will cause it to start losing its potency very quickly. As you can see from the county comparison above, some of these counties are kept very current, but some of them aren't. If the delinquent tax filter is important to you (as it is to me), you'll want to make sure you're only working in a county that is kept current. The unfortunate truth is – in many counties, there's only one way to do this right. When delinquent tax data is important to me, I skip all of these services and get my lists directly from the county. Getting this data from the county can be a HUGE pain in the neck for a lot of reasons. Even though the data works very well, most counties won't make it easy. IF you can get their list, it will usually be in a format that is far less organized than the services above provide – but if you can find a few counties that will provide their list in an acceptable format at a reasonable price (0.01 – 0.25 cents per parcel is what I'm accustomed to paying), you'll also find that it works incredibly well, and can only be rivaled by a few data services in a few select counties around the country. If you're interested in taking the plunge and getting your list from the county, this blog post explains exactly how to do it. Also note – delinquent taxes are definitely NOT the only cause of seller motivation. I've bought a lot of properties from owners who were not tax delinquent… so keep in mind, while it's certainly an effective filtering criteria when it's available, you can still find PLENTY of opportunities from owners who have their property taxes paid current. When I was compiling this information and recording these videos from each data service, what I took away from this exercise was that none of them are perfect, and none of them have everything I would want to see. Some of them are GREAT at certain things (like pulling lists) and TERRIBLE at others (like doing property research). Others are extremely effective at filtering lists to narrow down certain property types and property owners, while being completely incapable of filtering out others. Some data companies offer a lot of filtering flexibility and powerful data solutions but charge a very high price for access to their database. Others provide a very affordable and easily accessible platform but aren't necessarily the best fit for every real estate professional (and of course, you'll never hear any data company talk about the things they aren't best suited for). In the end – nobody seems to have it figured out from all angles, but if you know exactly what kinds of properties you're looking for, and if you know that the specific data you need is available in your area AND it's accurate and up-to-date, you should be able to nail down which of these services can best meet your needs. I can't tell you which one is best for you – but if you have a thorough understanding of what you need and how much you're willing to pay for it, you should be able to find the best option. 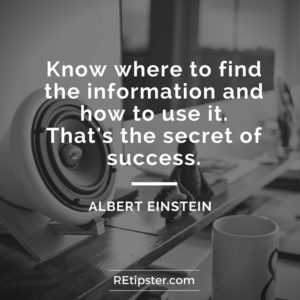 The most important thing is for YOU to understand what you need, what types of properties you're pursuing, and what kind of information you're going to need to do the job effectively. Every data company brings some kind of value to the table, but in order to get the right kind of value that fits your needs, there needs to be very little ambiguity about what you're looking for. Want to Use My Blind Offer Template? What are your sources for Commercial Real Estate? I don’t typically search for commercial real estate – but if I did, I’m sure any of these services could be used to get the job done. The only question is what specific kind of commercial real estate you’re looking for. The more specific you can get about what you’re looking for, the better direction you can have about which service is the best fit for you. Primarily multifamily units. MF in states (Texas) that hide data. Plus leasing data for large commercial office buildings. Just on the surface, it sounds like ReboGateway might be worth taking a closer look at. Try giving them a call and see if they have the kind of data that would help you in the specific county you’re working in. Thank you for this article and all of the valuable information about these databases! This has helped me to understand what each company has to offer (or not). I am currently subscribed to Rebogateway (which is an awesome database) but the drawback as you mentioned is having to pay for additional counties. I will definitely take a look into EasyAgent247! I will look into AgentPro247…my correction! Thanks Evelyn, I’m glad you’re getting some good value out of ReboGateway! As you probably saw in the blog post, none of them have it all nailed down perfectly, but if you thoroughly understand what YOU need, you should be able to find a good solution that provides the best value for your situation. Best of luck! Nice blog post Seth….very detailed and well thought out! Curious to know what your closing rate (on average) would be on that 5-20% response rate? In other words how many deals would you close on that 5-20%? Hey Thomas – thanks! I’m glad you got some value out of it. My closing rate varies (depending greatly on how motivated each seller actually is), but I’d say on average, I close 1 deal for every 12 of the sellers I send offers to. In the end – if you’re handling each step of the process the right way, it mostly boils down to a numbers game. Hello, just wondering if any of these services offer EMAIL addresses to reach out to people, instead of addresses and possibly phone numbers. Thanks! Hi Kimberly – that’s actually a GREAT question (I’ve wondered from time to time if that would work – but never explored it in much detail). If anyone would have that kind of information, you might want to check out Melissa Data. They have ALL KINDS of data solutions (and it goes further than just real estate). May be worth giving them a call to see if they have anything like this. Do I have that right? Thanks. Hi Thomas – you’re on the right track. Of course, the numbers are never exactly that predictable, but usually the initial response rate is anywhere from 5% -20% (depending on how well the list was chosen and filtered) and the acceptance rate is around 1 in 12 (on average). I’ve had campaigns with much better and much worse results, but hopefully this at least gives you a general expectation. But what % of your incoming calls result in you mailing out an offer. Thomas was thinking you meant that you get 12 calls and you send 12 offers, but I’m almost sure this is not the case. Hi Jeff! In the beginning, that actually was the case (because I was making offers on literally EVERY lead that came in the door)… but you’re right, these days, my offers are much more selective, because I only go after deals that meet a certain profit threshold. The vast majority of my leads come in through my website now (so they aren’t reliant on me continually paying for direct mail campaigns), and I probably make offers on half of the submissions I receive, and the acceptance numbers follow suit with my earlier comments… maybe even a bit less, because higher-end properties can be more challenging to get for pennies on the dollar. Keep in mind though, many people aren’t nearly as selective as I am – so depending on how well your list was filtered, you might make offers on closer to 70% – 80% of the responses that come in (and these numbers can vary quite a bit depending on a number of factors). Seth, thanks for the great articles and pod cast. I’m a newbie to Investment, and I live in rural West Virginia. Do you have any experience with obtaining info from this area. What’s your thoughts on how someone who may live in a small town, rural setting. I have to assume that it will be much tougher to get leads, than if living in a larger city. Thanks again! hey Seth, appreciate all the great info man. quick question for ya. I live in rural West Virginia, and will be focusing primarily on vacant land. Couple questions, Do you have any experience with investments in this area. ,and whats your advice on generating enough leads when living in a smaller populated area. How far should you branch out? Hi Chad, thanks for the kind words! I have looked at a couple of deals in Virgina (so, different state, but somewhat similar) – and I thought it was a great place to look for property. If I were looking in that area, I’d focus on getting a good county and finding all the vacant land owners who live out-of-county (tax delinquent would be even better, but not necessary to get started). If you start looking, I think you’ll find there are PLENTY of opportunities to be had. Brilliant work I must accept. the information abut the handling of data is very good along with the way of delivering. Yes most the brokers do use the data and I think this article will definitely help them in understanding the use of that and marketing as well. All the best and keep the good work. Thanks Mark – I appreciate the positive feedback! When I try to go to the subscribe page on agentpro I see no bronze or silver levels. I believe that may have changed. Hopefully just my iPad. Hi Alan – good question. AgentPro247 has actually changed their pricing since I first made that video, but if you enter in partner id CFGRSH (and click “Update”) – you’ll see some different pricing options come up (which includes the subscription options you’re looking for). What a great compilation of info! Appreciate your efforts putting this together. I took some of your earlier advice and have been using AgentPro247. I have been very satisfied with the data and the cost. Thanks again for delivering such actionable content. That’s great to hear Marc, thanks for sharing! I’m glad you’ve found it helpful. Thanks Seth for all valuable information. From our experience, data provider companies sometimes give unverified database when they mention It’s verified. It’s hard to believe about accuracy. What do you think? Hey Alex, thanks for sharing your experience. When you say “verified” – are you talking about when they say their database was last updated (i.e. – they say it’s been updated as of X date, but it clearly hasn’t), or is there some other measurement you’re using in reference to the verification of the database? I guess in the end, it seems like we’re kind of at their mercy. If they say one thing and it isn’t based on reality, there’s not much we can do to cross-check them other than going line item by line item and comparing their list with the county (which sounds like a nightmare). Seth, you are right that in the end it seems like we’re at their mercy. But I believe there are some email marketing lists verification service. Do you know any affordable service that can verify If those email addresses are valid? If this happens, we can be on safe side, I believe. Hi John – I wish I knew of one, but other than doing it yourself manually (or hiring a less expensive VA to do it), I don’t know of a service that offers this kind of thing. If you ever learn of one, definitely let me know! Seth, thanks for your answer. When I said verified I mean ‘the bounce rate’. Most of them say that their email marketing database is 2016 updated. If this is the case then there shouldn’t be any bounce rate I believe. But in reality, a lot of emails are actually bounced back and not delivered successfully. Hope that clarifies. Yeah – that’s hard for me to answer, because I haven’t used any of these sites for email marketing, only for direct mail (physical letters and postcards via USPS). Mr. Seth Williams, you researched and compiled great information. Do you think we can generate leads using database marketing directories purchased from these data sources? Thanks Komal! Yes – I think it’s certainly possible… but it’s also not necessarily a fool-proof method. Before you spend any significant money on a direct mail campaign, it’s worth doing some double checking to make sure you’re working with reliable data. As long as you know the data is good (and you know how to filter it effectively for your target recipients), it can be a very powerful way to handle your marketing. Thanks for clarifying Brian, I appreciate the heads up on that! It looks like DataTree may be your service of choice since you’ve made this post. How would you rate it along the same criteria as in this post? Hi Michael – that’s right. I actually am going to be updating this blog post in the next few weeks with new information on how DataTree works. So far, I would say DataTree has the best user interface, and probably the most useful and versatile filtering functions, but in terms of the quality of data, it’s similar to the others, in that it varies from county to county. It’s still always worth verifying when it was last updated before you start using it. I hope that helps! Hi Nakeem – sorry to hear about that… unfortunately that happens in some counties. It’s annoying, I know. In terms of the delinquent tax list, if you can’t get it from either source – your best bet is to just move onto a different county. 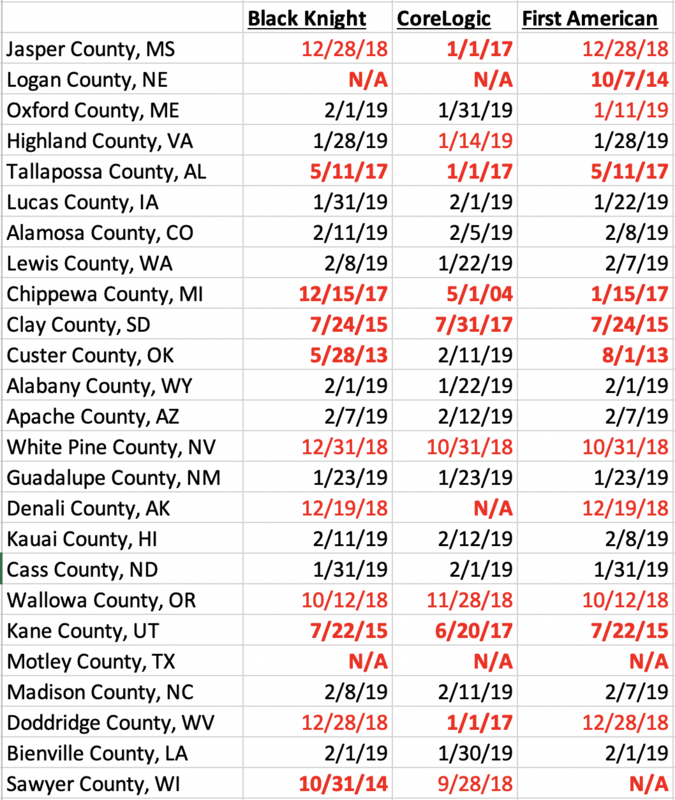 Some counties make it extremely hard to get your hands on this list, but others make it very easy… you just have to keep searching until you find the counties that make it easy for you (and once you know which ones they are, you can keep going back to them again and again). Just found this site while performing research late at night! Great information – Thanks for offering valuable insight! Of the companies mentioned in your article, are there any that provide bulk data on a month-to-month basis instead of an annual contract? Also, do you have any experience with just offering real estate analyses to potential investors or have you only personally invested in commercial and/or residential real estate? Thanks John, I put a TON of time into this article, so I’m glad you found it helpful! I believe ReboGateway and AgentPro247 both have a month-to-month options. I’ve helped others figure out their own real estate analysis in the past, but most of my analysis has been for properties that I intended to purchase (mostly residential). You have cited the example of several companies with clearly mentioning pros and cons of each. Thanks for this analytical writing. What I request you is to include email list data from Confaab as well. Because Confaab also has dually verified and regularly updated real estate email list. Thanks for sharing Rosie! However, this blog post is looking primarily a data services for the purposes of direct mail and property research – and I think email could certainly be valuable, but it falls into a different category altogether. I appreciate you mentioning this either way! I’m a real estate agent who is fairly new with about 1 1/2 years under my belt. I have sold a couple property but they come every 3-4 months and they were mostly buyers generated from rental leads. I wanted to start with getting seller listings instead so I began looking for ways that I can, but it seems like direct mailing is the most effective way. I haven’t found a good source in which I can until I read this blog. Out of everything that I have read I would definitely say that there are different ways to get motivated sellers. However, I’m looking for the strongest way and also pre-made letters that I can mail out to the prospect. Any help on this? Hi Reginald – I’m not sure it will fit exactly with what you’re looking for, but you might find these examples to be helpful. I’m also working on putting together some variations on these in the form of an actual letter in an envelope – I’m hoping to have those examples posted on the blog in early 2017. Hi Seth – I was wondering if you had a post card example that I could use for for trying to reach motivated sellers for wholesaling? I want to start sending them out via Click 2 Mail. Thanks in advance. Hi Damian – sure thing! Check out this blog post. Seth, I bought the postcard template and had a few questions. On the personal letter one, how do input the homeowners full name instead of “To whom it may concern”? Thanks in advance! Incredible amount of info. Thank you for taking the time to analyze all of these list sources. A quick question: we primarily call our leads, in your opinion, what data provider is best for property data with phone numbers? Hi Donny – I haven’t used it personally, but I’ve hard that Cole Realty Resource is a good option if you need phone numbers. Might be worth checking out! This was a very informative article – Thank you! I am wondering in your experience if you’ve ever run across a data company that has the ability to filter on or identify land-locked parcels? Or perhaps if you’ve found a method to identify these in your data sets in case you want to filter them out (without having to individually check each one in your mail merge). Hi Drew, thanks! That’s a great question about filtering landlocked parcels… I’ve never done that specifically, but I feel like there has to be some way to narrow down those types of properties, at least in some counties. You could probably contact any of the data companies and ask about this, they might be able to give you some helpful suggestions (say, if you wanted to get only properties that have no information available for the physical street address, that might be one place to start). Thanks Seth, appreciate your quick feedback! awesome info, i signed up for rebogateway for bankrupcy list, do you have any other data providers that you came across and found out to be good? Hi Jin – one other provider that may be of interest is datatree. I’ve heard great things about them as well. Thank you for the great info Seth! I maybe coming late to the game but I really appreciate your comparisons between sites! I have been using AgentPro for 2 months now. I am running into a problem with downloading a delinquent tax list and finding about 40% don’t actually have owner mailing addresses needed for my direct mailing campaigns (not the property address, but he address to send the letter too). Have you run into this problem and if so, were you able to fix it with the criteria? I called the BlackKnight HelpDesk and they were pleasant but could not find a way to filter out records without mailing addresses. Any help or direction would be appreciated! Hey Derek! Yeah, when it comes to delinquent tax lists, most data companies actually aren’t a very reliable place to get this information. For whatever reason, they have a very hard time keeping this information current (it must be fed to them through some other source, if at all). In my experience, if a delinquent tax list is specifically what I need, I have to get it directly from the county (which is usually a lot harder, I know). Of course, if you’re still having issues with missing addresses in the county you’re looking (even when you’re not searching by tax delinquent status), it could simply be an issue what that county’s database. Your best bet would be to try a different county (maybe the one next door) and see if any others can produce better results for you. Alternatively, you could also try a different data service and see if it’s able to do any better for you. Thanks Seth! I will check with the county. I appreciate the link to the “Everything You Need To Know About Getting Your County’s “Delinquent Tax List”” Blog! 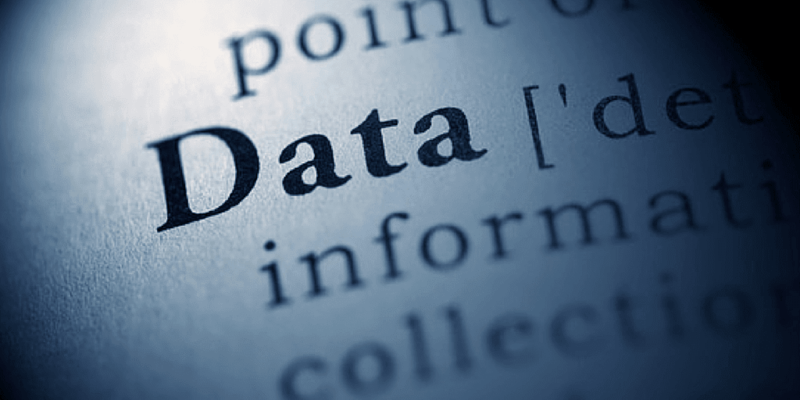 An excellent overview of data providers! You have a good writing style and consistently provide good and thorough information. Are you familiar with Propstream.com? I know of a number of REI who have moved from services like Realquest to Propstream. I wondered how it compared to Datatree and the others you reviewed. Thanks for your contributions. Hi Zach – I’m not familiar with that one, but I know there are A LOT of smaller companies out there that are basically re-sellers of the same information collected from one or more of these big three databases. I think they if offer new filtering options or database information beyond the “big 3” mentioned above, they could definitely be worth checking out. I’ve never heard of it. Sorry! What an incredible article! It is the most clear and comprehensive review of all the real estate data service providers I have ever seen. You provide a complete analysis of the cost, quantity and quality of the data from each service along with a side-by-side comparisons, giving investors all they need to make an informed decision. The research for this piece must have taken months to put together. If you ever tire of the real estate business, you probably could make a career as an investigative reporter. Thanks so much Josh! Yeah, you’re actually spot on – it took a TON of time to put all of this together (probably the most time of any single blog post I’ve ever written). I’m really glad you’re seeing the value in it. Thanks for reading! Thanks, Seth. This is one of the best, most complete and objective articles, on data availability, pricing and usage tips I’ve seen. I’ve been buying and selling land since 2014 and I found this a refreshing article to read and remind me of alternate sources and approaches. I use data direst from counties, AgentPro, and Parlay most frequently. That’s great to hear Karl! Thanks for the nice compliment (this one took many, many hours to put together). Those data sources you’re using are all pretty solid in my experience – but if you’re ever shopping around for something else, hopefully, you got some good ideas above.